In the event that the Member falls sick or experiences an accident whilst traveling outside The People's Republic of China (including Hong Kong, Macau and Taiwan), the Member can request assistance from Europ Assistance. Provide travel information for the Member's destination countries. Such information can include passport, visa and vaccination requirements of the countries in which the member will be. In case of an emergency, Europ Assistance can attempt to contact the member's designated next of kin. Should the Member need translation assistance, Europ Assistance can refer the Member to a local translator. In the event that the Member needs a doctor, and in the opinion of Europ Assistance's doctor it is necessary to evacuate the Member to the nearest registered hospital for urgent medical treatment, Europ Assistance can arrange transportation and any en-route medical care and supplies. 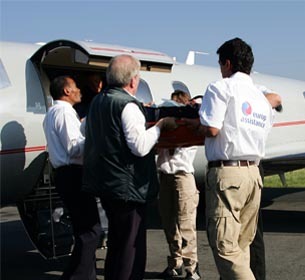 Following a medical emergency, if care has been provided close to the Member's place of sickness or accident, Europ Assistance's doctor deems the Member unfit to continue their trip, and their medical condition allows, Europ Assistance will organize a medically supervised repatriation of the Member to their country of origin or principal country of residence whilst traveling abroad. If the Member is hospitalized, Europ Assistance can arrange for the transportation of a next of kin and provide them with local accommodation. Europ Assistance can assist the Member to make arrangements for the unattended children to be returned to their country of origin or principal country of residence whilst traveling abroad. Following a medical emergency, if the Member's treating doctor deems it necessary for the Member to rest after their discharge from hospital, Europ Assistance can organize accommodation for the Member in a local hotel. If the Member dies whilst traveling abroad, Europ Assistance can organize the repatriation of the Member's mortal remains or ashes to their country of origin or principal country of residence. If the Member passes away and their next of kin needs to arrange for the Member's funeral abroad, Europ Assistance can arrange for their transportation and provide local accommodation.